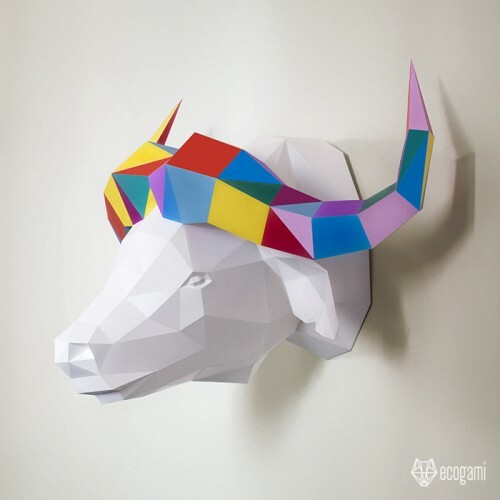 Make your own papercraft buffalo trophy with our PDF template! Just follow the instructions & you will be proud of your low poly animal head. Isn’t it an original wall decor to hang on one of your walls? ► Print one of the patterns (choose the sheet format which is more convenient for you, the size of the sculpture is the same with A3 or A4 paper). The paper must be thick (200 / 300 GSM / grams per square meters). The one I use is 270 GSM & it is perfect for that kind of sculpture. You can print at home if you have a printer or, easier, go to the nearest Print shop, you could buy the paper & print there. ► You have printed one of the patterns! Now just check you have the following tools: a pair of scissors, a ruler, white paper glue and a paper scalpel to fold the paper (could be a scoring tool / cutter pencil or even a small knife). You are ready to begin! ► Difficulty Level: Medium – Few small parts for the ears and the eyes but nothing very complicated.